Please contact CFL for more information about the study. Please refer here for the Straits Times Article about the study. The Singapore Rail Corridor is a 26km long right-of-way that used to route trains from the Malaysian Peninsula to Singapore for almost a century. A continuous and seamless corridor, it runs through the whole island of Singapore along the north-south axis, from Woodlands in the north to Tanjong Pagar in the south. In 2011, the Keretapi Tanah Melayu(KTM) railway company, owned at the time by the Malaysian government, ceased operations and the railways lands reverted back to the Government of Singapore, which is now evaluating its conversion to a green space for recreation and non-vehicular commuting. The combined area of the rail corridor is approximately 173.7 hectares – three times the size of Botanical Gardens. But as a former foreign-owned rail right-of-way, the rail corridor has grown separate from the city, with very limited connectivity to the surrounding built environment and people. The rail corridor in the context of Singapore. Since the re-opening of the corridor to the public in 2012, there has been intense interest over the future potential of the site (Peng and Hong 2011, Yong 2010). While no specific plans describing how the site is going to be developed have yet been released by Urban Redevelopment Authority (URA), the Government of Singapore has expressed intention to study the “possibility of maintaining a continuous green link along the Rail Corridor without affecting the development potential of the lands”. Regardless of what the future holds for the corridor, one can hardly overstate the importance of the site for enhancing liveability in Singapore. The sites passed by the corridor contain numerous housing estates, businesses, MRT and bus stops and important cultural institutions in close distance. A great number of residents and employees could potentially benefit from the corridor being developed into a long and seamless park. Enhancing accessibility to the corridor from the surrounding areas will play a crucial role in developing the site. A better-accessed and less restricted corridor would lead to a better integration with the surrounding built environment, maximizing opportunities for people to go to work by bicycle, on foot or even run. This study investigated how the connectivity of the corridor to surrounding people can be improved via strategically positioned connections to the corridor -- pathways, bridges, stairs, ramps and extensions to the surrounding street network. We evaluate which locations along the 26km corridor would provide most benefit in improved accessibility for residents, workers and commuters around the corridor, if retrofitted with new access paths to the rail corridor. The study provides an empirical understanding of what urban activities are distributed along the rail corridor and which of them are best positioned for integration with the rail corridor redevelopment. We first briefly present the historical background of the rail corridor. The second part focuses on the current urban form and land use context around the corridor, including the population, businesses, bus and MRT stops around it. 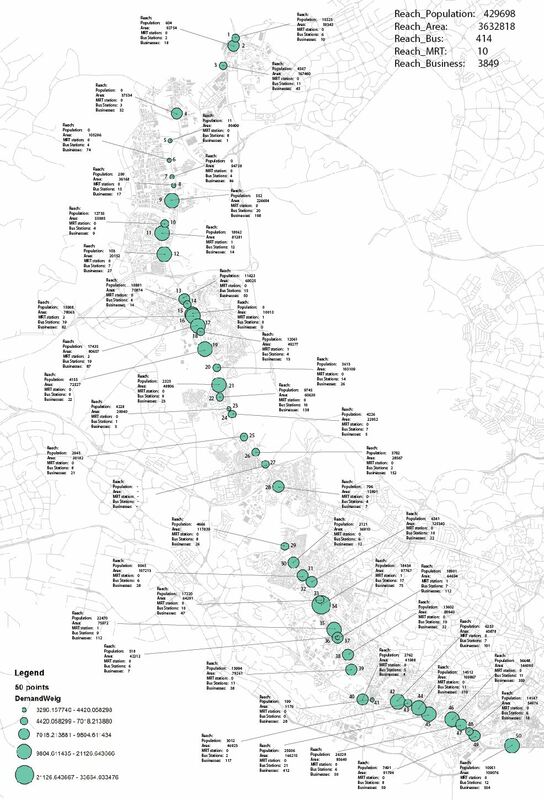 The third part explains the methodology used in the study and introduces potential connections between the rail corridor and the surrounding street network. We analyze how much each proposed connection could improve rail corridor access to residents, jobs, transit stations and commuters around it. The last section discusses the overall impacts of three scenarios, where a different number of new infrastructure connections to the rail corridor are simulated. Initially known as the ‘Singapore Government Railway’, the rail corridor that cuts through the island was built between 1900 and 1902 under the British Colonial rule, although the discussions over the need for a railway line transporting goods from Malaysia to the island of Singapore go back to 1860s. The railway also symbolized the growing importance of Singapore. According to the Singapore Heritage Society, “The development of the railway in Singapore is not just part of the socio-economic history of British activity in the region, but also a catalyst for local histories. From the mid to late nineteenth century, Singapore began to act as a key distribution and collection point for British Malaya as well as the wider region of Southeast Asia. Communication and transportation infrastructure were developed in tandem with Singapore’s increasing importance in the colonial economy established by the British in the region”. Within this context, it was crucial to construct an efficient transportation network to respond to the growing demand for products coming from and going to Malaysia from the port of Singapore. In the next decade, various extensions were added to the rail tracks, connecting it to the Tanjong Pagar Docks and all the wharves. A direct link to Johor was also established after the Causeway was built in the 1920s. In 1918, all the Singapore railway land was leased for 999 years to the Federated Malay States government. The southern end point of the tracks was marked by the construction of the Tanjong Pagar Railway Station in 1932, built on reclaimed swampland. Due to its close proximity to the harbor, the Station’s role was essential for transporting goods such as rubber, palm oil, copra and tin that Singapore actively traded. After Singapore separated from Malaysia in 1965, the control of the rail corridor and the lands associated with it was left under the control of Malaysian Government. Around the same time, in the later 1960s, as part of the city state’s profound economic restructuring, Singapore concentrated its trade on container ports and the goods coming from Malaysia lost their significance, along with the rail corridor (Henderson, 2011). However, the rail line continued operations under Keretapi Tanah Melayu Berhad (KTMB), the main rail operator in Malaysia. In 1990, Points of Agreement was signed between the Singaporean and Malaysian governments, which set the path for reverting the railway land back to Singapore, in return for three plots of land in central Singapore to be developed by a new joint venture with Malaysian Government, who would hold 60% equity over the development. After numerous failed negotiations, Malaysia agreed to accept the land swap offer in 2010, which included four parcels of land in Marina South, and two parcels in Orphir-Rochor. As part of the agreement, Singapore quickly removed the tracks and ancillary structures of the KTM railway, returning the hardware back to Malaysia in 2011. Finally, the rail corridor was opened de facto to public access in January 2012, stripped of its former infrastructure, and lacking basic access and connectivity to the city. At present, accessing the rail corridor along most of its 26km stretch requires hiking down poorly known footpaths along highway intersections or traversing private and reserved lands. Since the Singapore Land Authority (SLA) granted de facto public access to the rail corridor in 2012, it has become available as an enormous opportunity for cross-island walking, cycling and hiking path. Different civil society interest groups have organized periodic educational walks and various community activities along specific stretches of the corridor to inform people about the history behind the tracks (Singapore Nature Society, 2013). It is clear that the attention the corridor has garnered in the public debates over the last two years has made it an important future public space. However, both man-made and natural obstructions and poor connectivity to the city fabric around it prevent the corridor from being effectively accessible and usable. While taking a stroll in the corridor, it is common to encounter restrictions and fenced off sections, which makes crossing the tracks seamlessly from Tanjong Pagar to Woodlands impossible. It is difficult to locate most of the access trails to the corridor, even around the highly populated areas. Singapore’s development has historically turned its back to the restricted right-of-way of the rail corridor. It is hidden from surrounding areas and its sides have grown in with lush tropical vegetation. Many that live around the rail corridor have never been on it or even know about it. The physical and visual detachment is in part explained by the former rail safety requirements and the foreign ownership of the corridor until 2010. The rail corridor presents a number of unique opportunities for Singapore’s future. First, there has always been a strong desire for green space in Singapore. The ideals of a ‘garden city’ have been embedded in government policies on urban planning since the beginning of the Island’s modernization process. As early as 1968, part of the ‘Environmental Public Health Bill’ stated “the improvement in the quality of our urban environment and transformation of Singapore into a garden city – a clean and green city - is the declared objective of the government”. Singapore has since followed a rigorous campaign that prioritized greenery as an essential component shaping its urban environment. The Government’s vision has now evolved from striving to create a ‘Garden City’ to proclaiming a ‘City in a Garden’. According to the Center for Liveable Cities, Singapore’s total green ground coverage has increased from 36% to 47% between 1986 to 2007 (Hee 2013), though some have cautioned that this may be due to changes in measurement methods. In light of Singapore’s commitment towards a greener city, the vast underdeveloped land of the rail corridor presents a colossal opportunity to deliver a major green infrastructure and non-motorized transportation intervention to the city. The 26km long rail corridor would also make the most accessible green space in Singapore, not only for recreation, but also for commuting. The corridor lies in close proximity to major existing and future urban developments, which could potentially be linked via the corridor. Such developments include One-North near Buena Vista, a 200-hectare business park that is divided into several research and development districts and the Tanjong Pagar container port at the southern tip of the island that has recently been marked for redeveloped as an extension of the CBD (Zacharias 2013). At the northern end, the North Coast Innovation Corridor is being planned, which would span all the way from Woodlands to Punggol on West coast. These projects will strengthen the interconnecting role that the rail corridor could play between different employment hubs around the island. The rail corridor could connect these hubs with a green, non-motorized transportation spine for pedestrians, bikes, and electric-assist bikes. The Urban Redevelopment Authority (URA) an the Land Transport Authority (LTA) have recently announced that they are “actively looking at a much more comprehensive cycling network with supporting facilities such as bike parking etc.” (“The Walkable City” 2013). The rail corridor, which is already attracting cyclists, would be a natural place for serving as a spine for this network. Furthermore, the rail corridor could also play an important part in establishing continuity between a number of the island state’s wild-life sanctuaries. Singapore has already built a vast Park Connector Network (PCN) around the Island that brings people closer to nature. The PCN is expected to span 300km by 2015(A+U 2012). The corridor is situated in the midst of the Island’s precious green areas and infrastructure; it not only intersects with several branches of the PCN, but is also located next to the Central Catchment Nature Reserve – the largest green area on the Island – and the necklace of Southern Ridges parks to its east. The corridor could form a connector between currently disconnected green wild-life areas, serving as a wildlife species corridor in a addition to a human activities. These opportunities cannot be realized by good landscaping and public space design alone. Improving access and connectivity to surrounding destinations is key to achieving a well-used and equitably distributed green corridor for the city-state. In the following we investigate how accessibility to the rail corridor can be improved by introducing new connections – pedestrian and bike paths – from the surrounding street network. We focus our analysis on an immediate 15-minute walking range (1km) around the rail corridor. 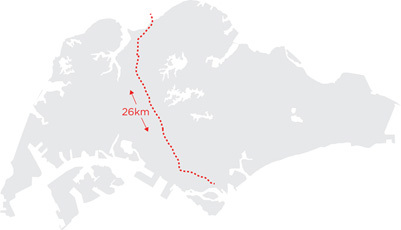 The size of this buffer is 53km2, roughly 7.5% of Singapore’s total land area. We obtained residential population and employment estimates for this area from census. We also gathered the distribution of all bus and MRT stations that fall within the buffer from LTA. The distribution of business establishments was unfortunately not available from any official source. We therefore obtained these estimates from Francisco Pereira’s work at MIT SMART (Alves, Pereira et al. 2010), who has analyzed a number of popular listing websites, including Yellow Pages, Google and Yahoo, and estimated the distribution of individual business establishments around the whole the island. According to these data, the total population inside the 1km buffer around the rail corridor is approximately 620,000. Major HDB towns located adjacent to the corridor include Choa Chu Kang New Town, Bukit Panjang and Queenstown. Private residential complexes include the widely publicized “Interlace” complex, designed by the Office of Metropolitan Architecture. For detailed accessibility analysis, explained below, it was necessary to interpolate population estimates to individual building locations. A significant data processing effort, which involved land use and building type analysis, allowed us to detect which buildings in the buffer area contained residential and commercial uses and to estimate their size. Based on this information, we allocated the total residential population to individual buildings in the area. There are approximately 8,000 business establishments in the 1km buffer around the rail corridor of varying type and size. We observe about 1,000 retailers and 440 food service and drinking places along the way. Different typologies of buildings are found throughout the buffer, including commercial, educational, recreational, transportation, industrial, and institutional structures. There is a large concentration of retail establishments in the southern end of the corridor around Tanjong Pagar. Northern parts of the site tend to house large industrial complexes. The buffer is also linked to the rest of the island through major traversing expressways, as well as numerous public transportation routes. There are 578 bus stops and 19 MRT/LRT stations scattered along the buffer. Our spatial analysis explored what locations along the rail corridor would generate most increases to accessibility if outfitted with proper access connections, such pathways, bridges, stairs or ramps from surrounding sites to the rail corridor. To do so, we simulated the potential accessibility impact of a large number of hypothetical connections to the corridor. Where should these candidate locations be placed and how should they connect to the surrounding destinations? One option would be to simulate a potential connection at even intervals – every 100-meters for instance – along the entire corridor, connecting each path to the nearest surrounding street segments, which leads to houses, jobs or transit stops around it. Since distance increases travel costs, it is clear that placing new potential connections closer to existing crossroads or street end-points around the former rail tracks would create better access. Further, accessibility also depends on the connectivity and density of the street network that leads to final destinations. When all else equal, new walkways that connect to existing street intersections, where multiple branches meet, reach more destinations around the corridor than walkways starting in the middle of existing street segments. 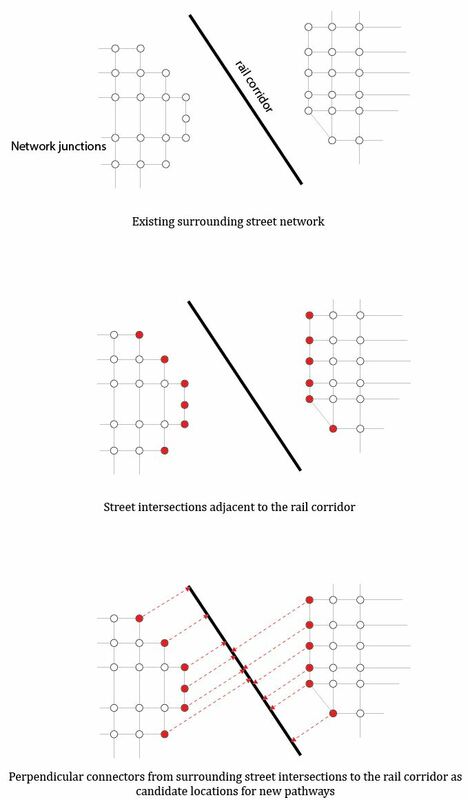 In our analysis we therefore decided to place candidate locations for new pathways at each of the surrounding street intersection, creating a perpendicular connector to the former rail trajectory (see Figure below). We subsequently established new network nodes on the rail corridor where the perpendicular connectors arrived (see Figure below). These new nodes form the initial candidate list for new connectors. However, a few cleanup operations were necessary. First, a few points had to be eliminated due to obvious terrain related obstacles. Second, it seemed reasonable to prioritize connections from streets that already intersect (as flyovers) with the rail corridor. These streets offer easy connection to the rail corridor and might only require adding a ramp or stair down the side of the flyover. We therefore added these existing intersections to the list of candidate points. As a result of these operations we ended up with a total of 422 candidate points for new connections along the 26km corridor. Accessibility can be measured to any type or number of destinations (Bhat and Handy et al. 2000). For an enhanced and equitable utilization of the rail corridor, we chose to analyze accessibility to surrounding residents, businesses, bus and MRT/LRT stations. The combined set of these points – residential buildings, businesses, and transit stations (including bus and MRT stations) became the complete destination set inside the 1km buffer around the rail corridor used for analysis. Each of the destination points was weighted in the analysis by the number of people it was estimated to serve. MRT stations, for instance, which typically serve a lot more passengers than bust stations, were thereby set to have a stronger impact on the rail corridor access than bus stations. The accessibility analysis was carried out along networks, estimating the accessibility gain to each of the potential destinations along the shortest available walking route. We used the ArcGIS Location Allocation tool to detect a set of best locations for newly proposed connections to the rail corridor. The tool utilizes a set of geographically distributed demand points to compute optimal facility locations from a given set of candidate points. In our case, facilities are chosen from the candidate nodes along the rail corridor where the new perpendicular connector arrive, while demand points consist of the surrounding buildings and transit stops, weighted by people and passengers at each of them as described above. The location allocation algorithm not only locates individual facilities (rail corridor connections) in the most efficient way to serve demand points, but simultaneously accounts for all neighboring allocations as well, avoiding scenarios where multiple high-access locations are suggested next to each other. How optimal the location allocation results are depends on the optimization criteria. Connections can be placed, for instance, so that no person within the study area needs to travel more than a specified distance to the rail corridor. This Maximize Coverage criterion is often used in locating emergency services, for which it is critical to be able to serve demand points within a specified response time. Another approach is to Minimize Travel costs, placing connections so that the sum of all weighted costs from demand points to the rail corridor is minimized. This approach is often used to locate public facilities (e.g. libraries), because it reduces the overall transportation costs of delivering access to the destinations. A third, Maximize Attendance approach chooses locations such that as much demand weight as possible is allocated to rail corridor connections while assuming the demand weight decreases with the distance between the rail corridor and the demand point. Bus and other transit stops are commonly chosen with the help of Maximize Attendance. Maximize Attendance assumes that the farther people have to travel to reach a destination, the less likely they are to use it. We proposed that the latter approach is best suited for determining rail corridor connections because the likelihood of using the corridor is also expected to decrease with distance from the corridor. We tested two scenarios for new connection points. Using the original 422 candidate points, we simulated the creation of 20 and 50 new access points to the surrounding destinations along the rail corridor. Building each new connection can involve costly infrastructure investments from the government and requires negotiations with adjacent landowners. The choice of 20 and 50 connections was deemed realistic over a 26km corridor as a first phase investment into the green corridor improvement. If placed at even intervals, for instance, 50 new connections would be 520 meters apart from each other. But an even spacing would certainly not yield as big of an improvement as optimally placed connections. It is necessary to further distinguish which connection locations yield the largest gains to accessibility and could therefore be chosen as first priority pathways to access the rail corridor. The results of optimizing location choices for 50 new connections to the rail corridor are shown in the map below. These include the fifty most impactful locations for new connections to improve access to the rail corridor to or from residences, business and transit stops within a 1km buffer around it. The connectivity of each of these connections is measured along the street network that links them to the newly proposed perpendicular connectors, as discussed above. The illustration below also explains how many residents, jobs, bus and subway passengers are reached within a 10min buffer from each proposed new connection. Most impactful locations among these 50 points are distributed mainly between the former Rail Corridor Station at Tanjong Pagar in the South and Holland Road intersection. This section of the corridor consists of the highest concentration of residential buildings, businesses, and public transportations facilities. Within this segment of the corridor, there are several locations that stand out with high demand weight and reach values. One of them (Refer to the Point #50 in the Figure) is found at the southern end of the rail corridor, where former Tanjong Pagar Railway Station is situated. This location can potentially provide access to around 11,000 residents living nearby, 12 bus stops and 354 businesses. Another examples from this segment of the corridor (Refer to Point #34 in the Figure), is located at the intersections of two busy roads next to the rail corridor: North Buona Vista Road, and Commonwealth Avenue, nearby One North – a large research and development hub – and where the busy Buona Vista MRT stations is also located. Surrounded by significant amenities nearby, this new connection would provide access to around 18, 000 residents, 17 bus stations, and 75 business around to the rail corridor. Another cluster of high-impact connections to the corridor is found between two HDB new towns: Bukit Panjang and Choa Chu Kang. One of the points found within this cluster (located at the intersection of Bukit Panjang Road), can provide access to 15,000 people, 2 MRT/LRT stations, 19 Bus stations, and 82 businesses (Refer to Point #16 Figure). Close to this area and further North, one can find another beneficial connection, situated next to the area called Yew Tee, a sub-division of Choa Chu Kang New Town with a mixture of HDB flats and private condominiums (Refer to Point #11 in Figure). This point would provide access to around 18,000 residents, 1 MRT station, 12 bus stations, 14 businesses. While majority of the proposed 50 connection locations are located close to the areas with a high concentration of residential units, there are exceptions. One of these exceptions featuring a high potential public benefit, is located adjacent to Sungei Kadut, an industrial estate bounded by Choa Chu Kang New Town, Mandai Estate and Kranji Reservoir (Refer to Point #9 in Figure). Located close to Woodlands, the area is known to have furniture-making industries with lots of employees who could benefit from the rail corridor as a non-motorized transport spine to get to work. Proposed locations of 50 new pedestrian and bike connection to the rail corridor. The aggregate impact of the 50 newly proposed pedestrian and bike connections to the rail corridor would yield access to approximately 430,000 residents who living within the 1km buffer zone along the actual street network. Note that this is a lower estimate than the total 620,000 who live within the entire buffer area, since the 430,000 people could actually reach the corridor by walking along the streets, not straight-line connections as a bird flies. There are 414 bus stops, and 10 MRT stops that could be accessed by these new 50 pathways to the rail corridor as well and the workers of approximately 3,800 business establishments could walk to or from the rail corridor in less than 15 minutes. These numbers indicate that the fifty most impactful locations can help to achieve a very significant improvement to green space accessibility and a new non-motorized transit corridor for many numerous beneficiaries in Singapore. With improved accessibility, the Singapore green corridor can be utilized by not only close to a half a million residents and the employees of around 4,000 firms in the immediate surroundings, but also become a sought-out hiking, biking and recreational trail for all residents of Singapore. To realize this opportunity, it is necessary to not only design a great landscape and attractive public spaces along the corridor, but more importantly, enhance accessibility to and from the corridor so that a maximal and equitable share of users benefit. This study has explicitly focused on travel between the surrounding destinations and the rail corridor, but we have not yet adequately addressed travel along the corridor itself. To do so, additional research is needed. Travel along the corridor presents a significant opportunity for people to commute to or from work along a pleasant green spine and offers ample room for recreational activities for weekends or weeknights. The corridor seems like a prime candidate for participating in the public bike-sharing program that is presently under discussion by LTA. Maintaining part of the corridor as a dirt path would offer a unique experience to get muddy on a lush, natural pathway near the downtown of one of the largest cities of South East Asia. Follow-up research is needed to understand whether or not people would be actually shifting to travel along the corridor instead of public transit or car, if provided with adequate bike lanes, footpaths and alternative transportation options along the corridor. The 50 locations suggested in this preliminary study also need more careful examination on site in order to determine their suitably for new connections given property lines and natural conditions around the corridor. There are of course also costs related to developing 50 new connections. If each new connections costs in the order of a million dollars to make, then the improvements would require around $50M total. Additional expenditure is need to renovate the rail corridor walking and biking routes themselves. But given the potential gains outlined in this analysis, opening up the rail corridor for public and equitable access, seems well worth the investment. Peng, L K and Hong, T W, 2011, “The Green Corridor Report”. Singapore Nature Society, Singapore. Accessed 20th October 2013. Yong, J A, 2010, “Nature Corridor proposal for railway land” Straits Times A24, accessed 24th October, 2013. Alves, A O, Pereira, F C, Rodrigues, F, and Oliveirinha, J, 2010, “Place in Perspective: Extracting Online Information about Points of Interest”, in Ambient Intellegence. Lecture Notes in Computer Science Volume 6439, pp 61–72. Henderson, Joan, 2011. Railways as heritage attractions: Singapore's Tanjong Pagar station, Journal of Heritage Tourism, 6:1, 73-79. “Garden City to Model Green City”, accessed October 24th, 2013. .